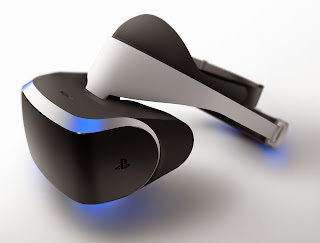 Sony Computer Entertainment will launch Project Morpheus in the first half of 2016. Project Morpheus is a virtual reality headset that can be used with the PlayStation 4 to deliver an immersive experience, be it for gaming, viewing movies, or possibly viewing the web in a new manner. The Morpheus VR headset covers a 100 degree view of the user. An OLED 5.7 inch display is currently used in the prototype providing a resolution of 1920 x 1080 or 960 x 1080 per eye. With a 120 fps output, the user should experience smoother images which would not deter from an immersive gaming session. Project Morpheus also requires the PlayStation camera to provide position tracking of the VR headset in relation to the player’s head and screen image rendering. The Morpheus prototype contains nine LEDs and supports 360 degree tracking. The Morpheus headset was designed for player comfort, where the headset is balanced and pressure is not placed on the face. The headset weight was reduced further for the most recent prototype providing for a less cumbersome feel. Project Morpheus supports 3D audio and is able to output the headset view to the TV screen potentially allowing split screen play where additional players can view and interact in a game. The Sony PlayStation 4 has Move controllers which adds to the immersive VR experience because players can physically interact with what they see onscreen. The Move controllers can represent player hands onscreen and buttons can perform functions such as grabbing, holding, or pushing objects in the virtual world. Since Project Morpheus and Oculus Rift are both launching in early 2016, we can expect a lot more to be revealed at this year’s E3 Expo 2015. Stay tuned for news on the VR generation.